We all encounter conveyor belts in our daily lives, some of us even in our homes - the ones we run on. As conveyors go the treadmill it is a simple piece of equipment, and can hold up well after putting thousands of miles on it. This would not be the case, however, without regular maintenance. To keep the conveyor in your packaging or manufacturing facility running well for the tens of thousands of miles it sees every month you also need to inspect it and maintain key components. Here are some of the most common modular belt and table top conveyor components that you need to check on a regular basis. 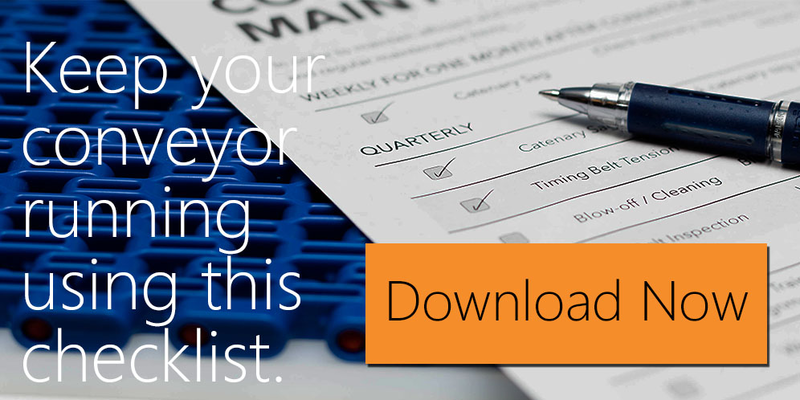 Want a PDF conveyor maintenance checklist? Download it here! The modular belt or table top chain should be checked for wear quarterly. There are several types of wear that should be noted as they indicate problems with the conveyor operation. These include how much the chain thickness has worn, how evenly the surface of the chain is worn, and how the chain is wearing on its edge, particularly for side flexing chain in curves. Also, cracks should be checked for in the conveyor chain and any section or link of a chain containing cracks should be immediately replaced. The distance from the chain to possible interferences should be checked regularly. Any location where the chain comes close to a stationary object, such as a nip guard or dead plate, should be noted. The object should be secured firmly so that it does not become misaligned and possibly interfere with the chains operation. The catenary sag section on the underside of a large modular belt conveyor. The catenry sag section of the chain should be regularly checked, particularly early in the chains life as this is the time when the greatest amount of elongation occurs. You can expect to adjust your conveyor for catenary sag twice in the first month after original installation of your conveyor. After the first month the catenary sag should be checked quarterly. Sprockets held in place by UHMW guides on a food grade stainless steel modular belt conveyor. The chain sprockets driving the table top or modular belt chain should be visually checked for wear. Types of wear to check for include hooked teeth, build of of debris in between teeth, and side wear. Additionally, sprockets should be listened to while in operation. Excessive noise or irregular sounds can be an indication of other problems. Both the side wearstips containing the chain as well as the supporting wearstrips should be checked annually for wear, particularly the inside wearstirp on a curve section. For straight running sections asymmetrical wear of side wearstrips can indicate a misaligned chain. Carry way wearstips on a stainless steel food grade modular belt conveyor. The shoes and rollers, which reside on the underside of conveyors creating a smooth transition from the catenary sag onto the wearstrips, should be checked for wear on the same frequency as the wearstrips. A conveyor should be checked on a regular schedule for dust or debris build up as they can reduce efficiency by increasing friction and also cause failure if build up is excessive. The amount of time between inspection should be determined by the environment, with particularly dusty environments such as paper mills and foundries being inspected and cleaned daily. For conveyors powered with a timing belt drive chain the timing belt tension should be checked quarterly. The method for verifying the tension can be found in the Drive Train Alignment and Tensioning section of your equipment manual. Drip pans are common for overhead conveyors to collect any leaking oil from gearboxes. If your conveyor has drip pans these should be inspected annually with any standing lubricant in the pan being discarded. 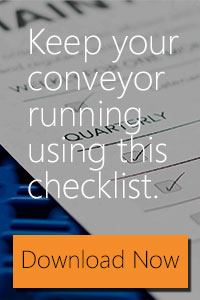 These are the most common things to inspect for standard conveyors. 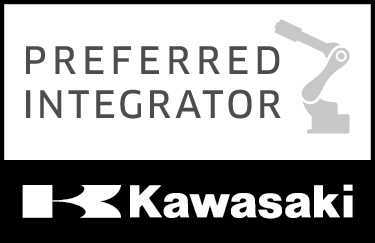 Specialized conveyors and fabric belt conveyors will have their own requirements. Take care of your conveyor and it will keep your business moving. 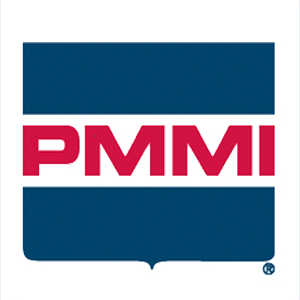 Conveyor Maintenance - Regular Inspection Keeps Your Product Moving was posted to Words in Motion - A blog created by Product Handling Concepts, your source for conveyor, conveyor equipment, and automation solutions.